Edupur Society a socio-cultural NGO in Tezpur, Assam was founded in 2009 by Amit Rajkonwar, I.T. Developer/ Social Worker with the motive to encourage, preserve, motivate and give wide publicity to the creative work of every child, as Edupur believes that every child has its own unique creativity. From 2009 to 2012, Edupur Society had choose to work on practical ground by volunteering with the Doorstep representative on various schools which would help them in identifying creativity of the students. On 12 March 2013, Edupur Society launched its official website “edupur.in” at Ban Theatre. The opening ceremony of edupur.in website was inaugurated by Dr. Amarjyoti Chodhury, former Vice Chancellor, Tezpur University. Edupur Society is registered under Society Act XXI of 1860, Govt. of Assam under planning commission, Govt of India. Edupur Society’s goal is to ensure that the youths enjoy the positive and creative aspects of self-expressions, and at the same time, allow their own success through creative work in a safe environment. Edupur society is able to equip these young participants with a new mind set and provide them with portfolio of tools for creative expressions that will give them hope and self-empowerment, builds leadership skills and self-esteem. Edupur Society provides the resources and independent platform that guides the children through the discovery of their own talent, interest and passion for the creative work that is mediated through trained professionals through workshops/ events/ seminars etc. organized by Edupur Society. The mission of Edupur Society is to extend the reach of creative work to various student population groups through the promotion and demonstration of the power of the creative work as important communication tools for success in our society. Edupur Society launched its new website www.edupur.in on 28 January 2014. 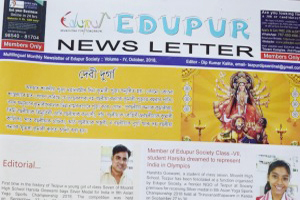 Edupur also publishes a monthly newsletter containing various public information, employment news, creative ideas of students, articles and many more.